WASHINGTON — Hillary Clinton had more regard for Wall Street movers and shakers than she acknowledged when claiming she scolded the financial industry for “wrecking the economy.” The criticism she leveled at Wall Street came mixed with praise — and thanks for the political donations. Bernie Sanders, like his Democratic presidential rival, understated what officials in Michigan are doing about the Flint water crisis, and said white people don’t know what it’s like to live in poverty. THE FACTS: In the same speech she is referring to, she praised Wall Street and thanked the “wonderful donors” in the audience — while urging changes in behavior. 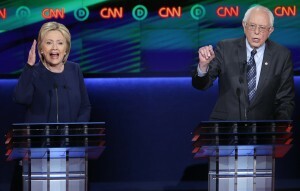 Clinton has repeatedly cited the December 2007 speech on Wall Street to show her toughness during the financial meltdown and fend off Sanders’ criticisms of her coziness with banks and investment houses. A ProPublica transcript showed that Clinton did scold Wall Street for its “significant role” in inflaming the financial crisis and urged financial leaders to take voluntary steps to stem the chaos. And as a New York senator, Clinton did call for a 90-day moratorium on foreclosures. In the speech, however, she spread the blame for the crisis beyond the big banks and lauded Wall Street for its work for the U.S. economy. The speech was more carefully calibrated than the stern lecture she makes it out to be. THE FACTS: Less likely to know, but there are, of course, millions of poor whites. The Census Bureau’s five-year American Community Survey, covering 2007 to 2011, found 14.3 percent of the overall population fell below the poverty level, with American Indians and Alaska natives being the poorest (27 percent of that group) followed by blacks (25.8 percent). Hispanic poverty rates ranged from 16.2 percent for Cubans to 26.3 percent for Dominicans. The white poverty rate was 11.6 percent, below the national average. THE FACTS: Not knowing the final details of the trade deal did not stop her from taking a position on it before: She favored it before she opposed it. As Obama’s secretary of state, Clinton was far more enthusiastic about the Pacific trade deal taking shape than she became once she was running for president and trying to appeal to the liberal wing of her party. As secretary she had given speeches around the world in support of the deal under negotiation, saying in Australia in 2012 that it “sets the gold standard in trade agreements,” a cheerleading sentiment she echoed elsewhere. She’s said the final agreement didn’t address her concerns. But the final version actually had been modified to drop certain provisions that liberal activist groups had opposed. THE FACTS: The state Legislature already has authorized $30 million to cover, retroactively, 65 percent of the water portion of people’s water and sewer bills. That covers some, but not all, of what residents owe. THE FACTS: It is. So far, Michigan has come forward with $70 million and Gov. Rick Snyder has called for an additional $165 million. Associated Press reporters David Eggert and Calvin Woodward wrote this report. Eggert reported from Flint, Michigan. AP writer Stephen Braun contributed to this report.